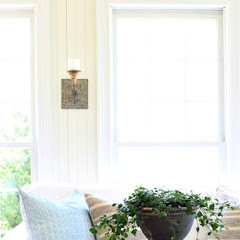 As I have read from several others on blogs and on instagram it seems that after the Christmas decor comes down most want calm and serene spaces. 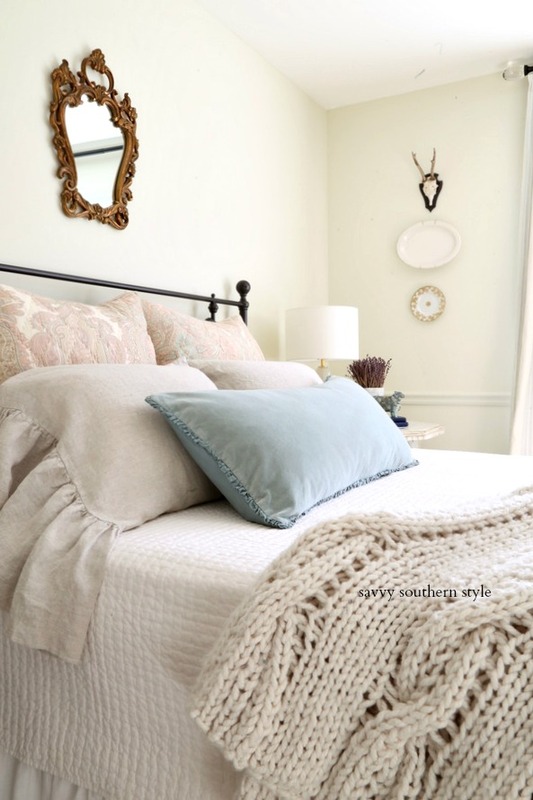 After I took the white tree down in this guest bedroom I changed out the bedding to this pastel palette as I am craving calm, too and of course I love trying different bedding combinations. The quilt folded at the end of the bed and shams may look familiar as they have been used in the master bedroom. The quilt is a king size and this bed is a queen size, but it works well folded at the end. 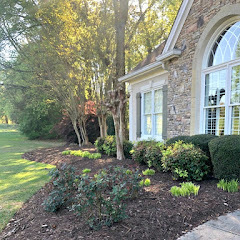 It's always good to shop the house for a simple makeover. 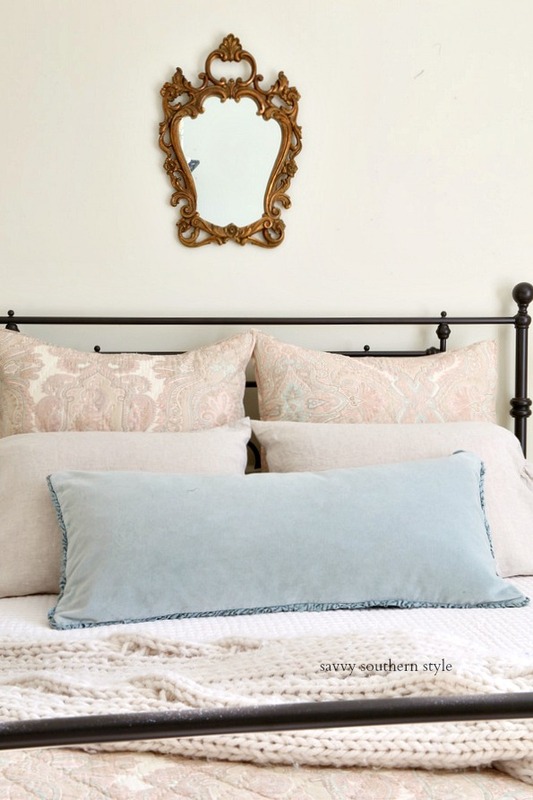 I also added the beautiful long velvet pillow with the tiny silk ruffle trim. It's the little details that make a pretty bed. The long ruffles on the standard shams add a bit of romance and femininity. Many have asked where I got these shams from and what I did was search linen bedding or shams on Etsy and you will find many results. Flowers are nice anytime of year, but especially nice when it's bare and gray out this time of year. 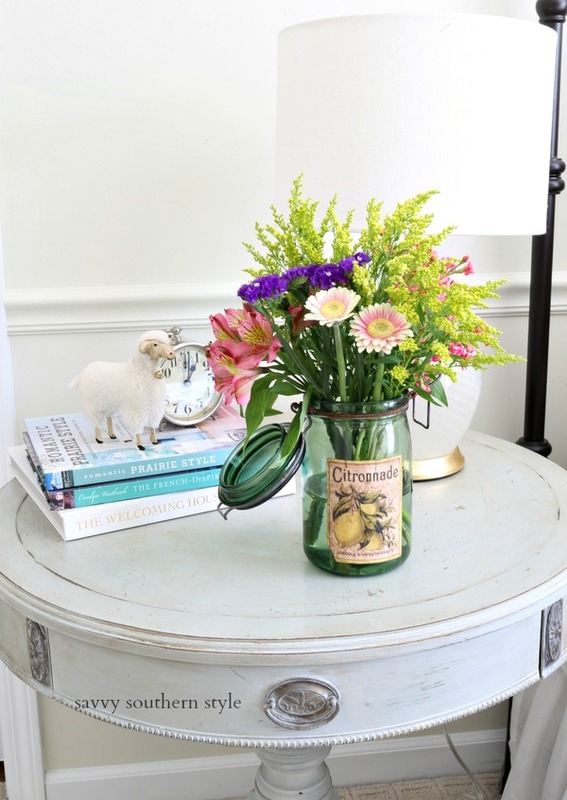 I tucked this grocery store bouquet in this vintage jar. 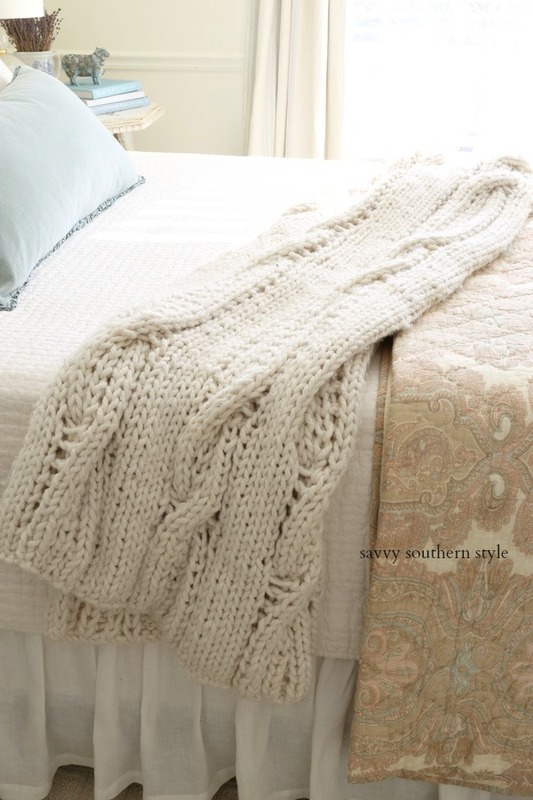 The knitted throw adds texture that is needed when using mostly neutrals. 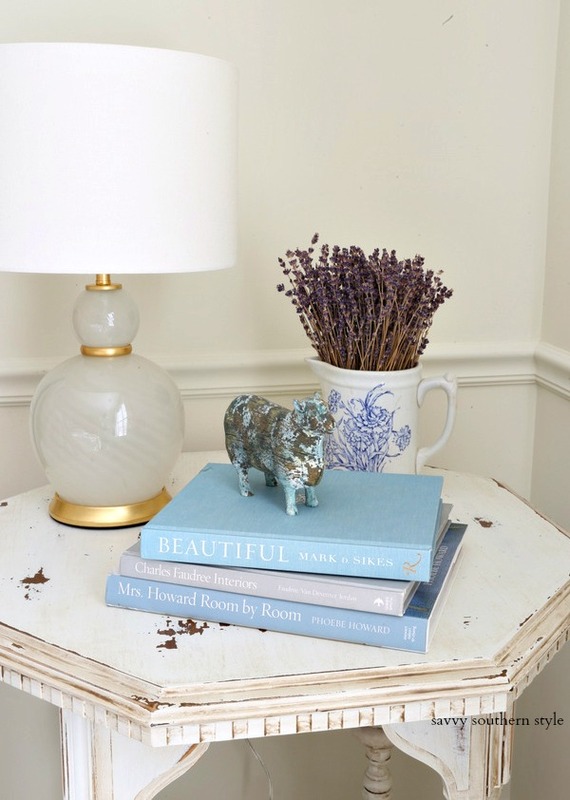 Stack of pastel colored books, sheep and an ironstone pitcher of lavender on this bedside table. 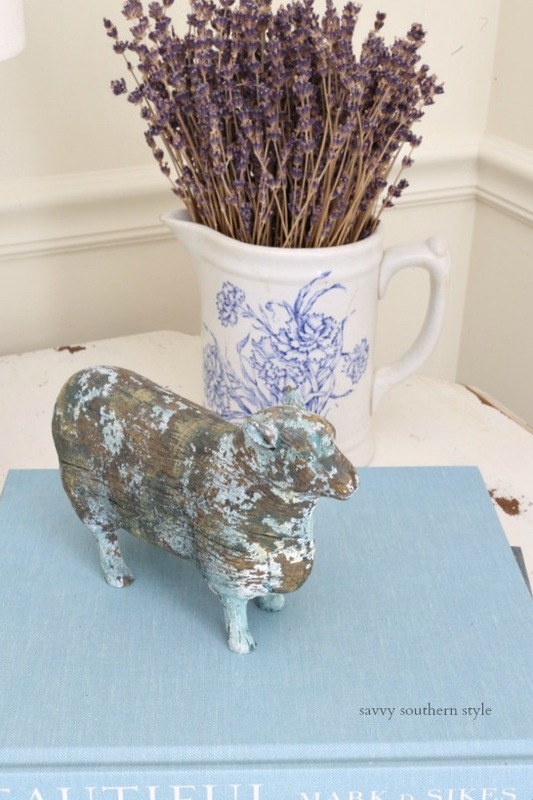 I've been asked so many times where to buy this wooden sheep. I'm afraid I have no idea. I bought it at the Country Living Fair several years ago and haven't seen another one since. 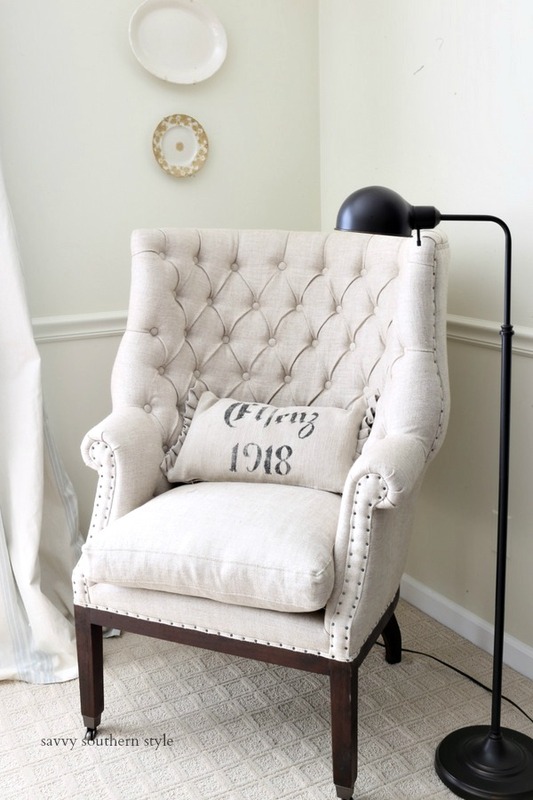 My favorite pillow sits on this tufted chair. 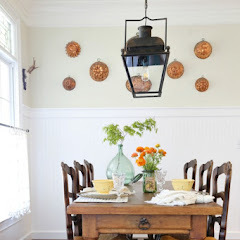 I changed out the blue and white plate on the wall for the gold and white for a muted look. You can see the corner of the black hutch and I am seriously thinking of lightening that piece up. I feel like it needs to be a lighter color in this bedroom. The black was alright in the dining room. I caught the sun coming in early yesterday morning which was so nice to see after a gloomy weekend. Oh, but it didn't last very long as the clouds rolled back in. No rain though. The purging continued all weekend. I don't have a before shot, but believe me I could barely shut the doors. I also cleaned out the tiny pantry closet and dish closet and donated another car load. It feels so good to get these things done.....finally. Mr. Savvy asked me if I was done and I quickly replied that I have just scratched the surface. I absolutely love the blue velvet pillow!! This is so pretty Kim. I loved it on Instagram yesterday. I need to purge my closets. I cleaned out my office that was a near miracle in itself. I love your pastel room. It looks very calm and relaxing. You have given me the inspiration to shop my linen closets as well. I love the soft pastel colors you used on your bedding and frankly I am tired of gray with all the gray skies looming outside. 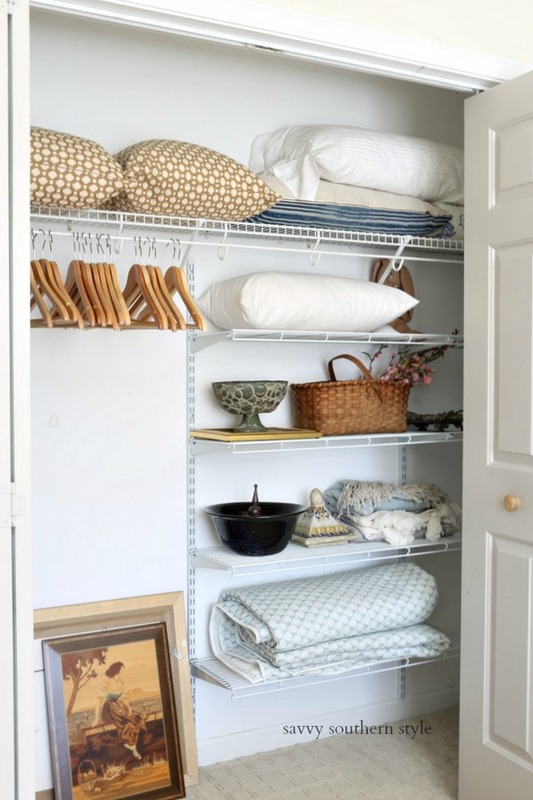 My linen closets need to be purged as well as I can barely get them closed. Kim, this bedroom is SO pretty in pastels! I love all the bedding! How beautiful. You have the prettiest bedding and that blue pillow is lovely. Even your closet looks nice! You never disappoint with how your change up your guest room. This is so serene and pretty. 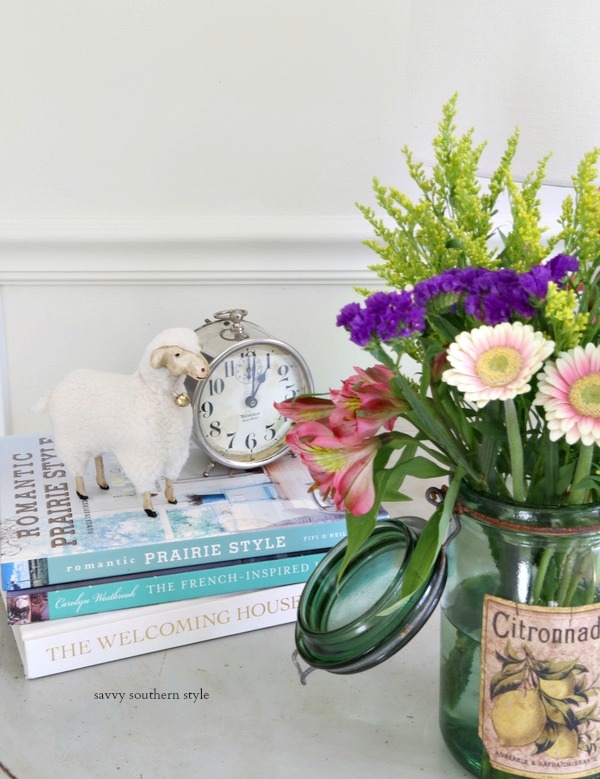 Love the bedding and the sweet little lamb on the night table. Kim, as always it is so beautiful! I would have enjoyed "shopping" your discards! I've purged the last two winters but somehow I am always bring "new" things back in and the gaps fill back up! 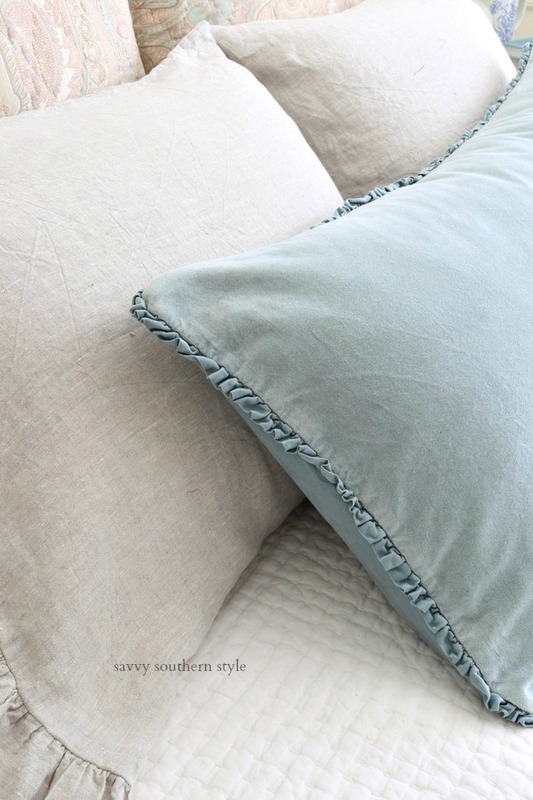 Kim, seeing this lovely post reminded me that I want to order those ruffled, linen shams. I looked online and they are offered in a King (20x36) and a Sup King (20x40). Do you remember which size you purchased? I love the way they drape on your bed. Thank you. Here is the link to what I bought. Thanks so much, Kim. Did you get the natural color? Whatever the oatmeal color is. That's what I got. Thanks. I see there is both an oatmeal and a natural color. Hi Kim. 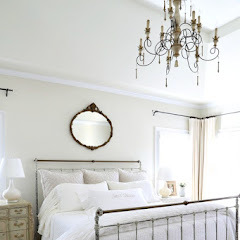 You've created a beautifully tranquil winter bedroom. It looks soft, warm and so inviting. Your post surprised me as I had the very same feeling about our master bedroom once the Christmas decorations were stored away. I needed something soft and quiet for winter and definitely not too feminine. I turned to the natural colors, too. 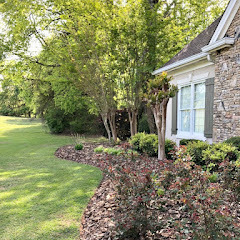 Our walls had just been painted "Creamier than Cream" last fall, so wall color wasn't a problem. 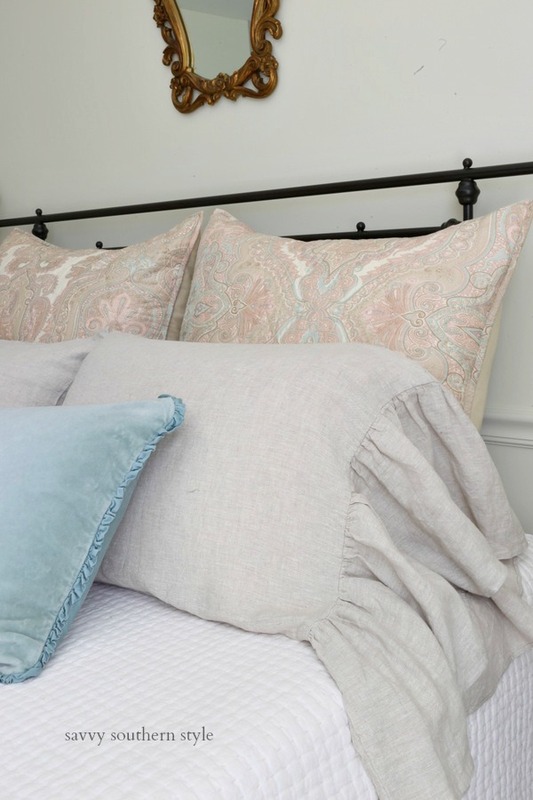 Our quilted coverlet is also a rich cream, the perfect background for some pastel additions. 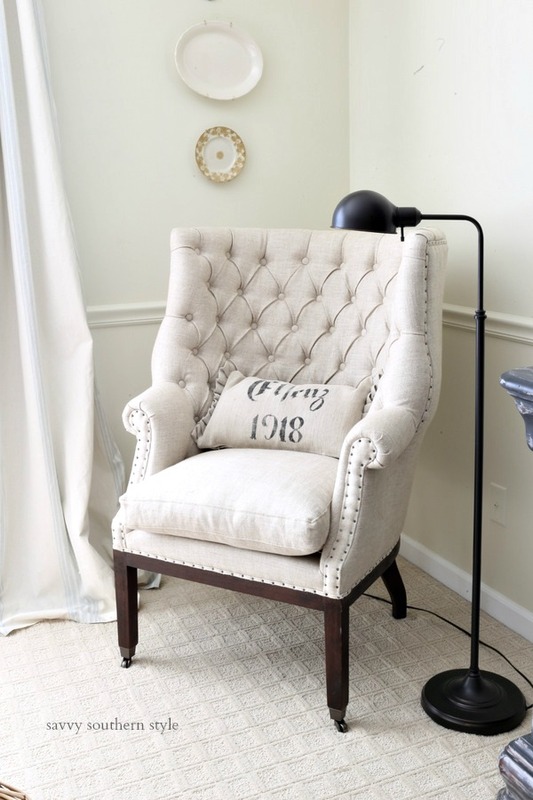 I love to sew and bought a few yards of pale celadon green distressed velvet and made large pillow shams for the bed and a pillow for the chair in the reading nook. I also bought the same distressed velvet in light dusty blue and made a large roll pillow and two smaller throw pillows for the bed. I had some pale green damask ruffled shams my grandmother made years ago and a lovely knitted lavender throw my mother-in-law gave to me when we were first married. Finally, I've been able to use that, the color had held me back before now. 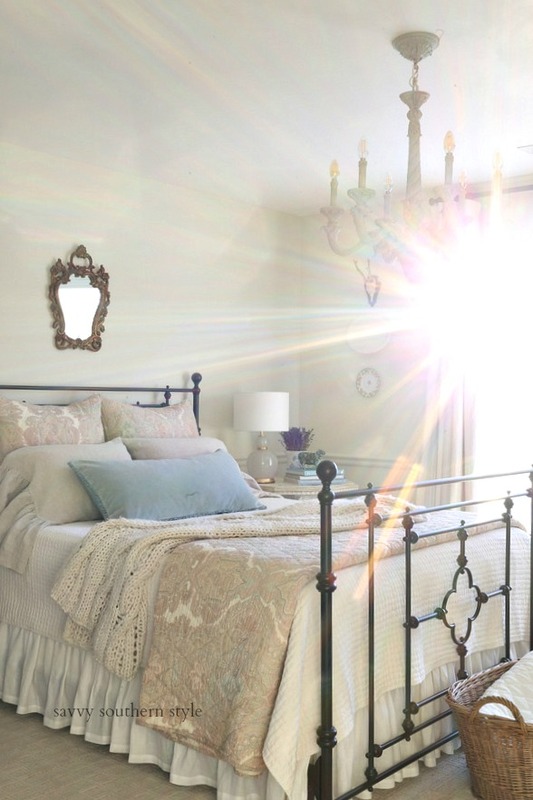 Extra little touches, antique linens I had stored and a change of lamps gave me the cozy, pastel look I envisioned. MY husband instantly liked it...icing on the cake! 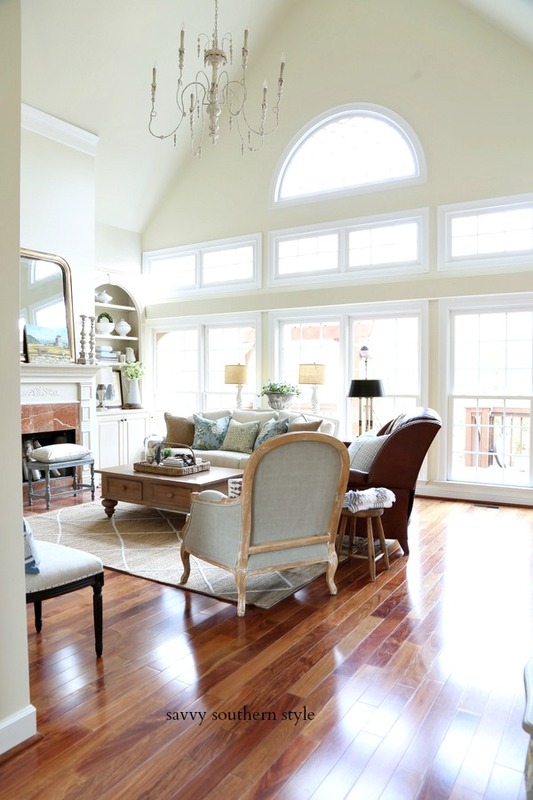 This room is so pretty!! It looks so cozy, perfect for the winter months!!! Love the winter pastels, Kim! So beautiful! It's a nice pick-me-up from this gloomy winter weather. Very pretty. I love the pillow. I am getting very fond of pastels and the room looks fantastic...saw that image on IG and how great to catch that ray of sunshine...and I spy a pretty vintage French canning jar....and look at you and that super organized closet! I sense a hint of you painting that armoire again!